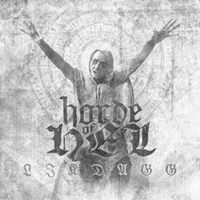 Horde Of Hel is a mysterious Swedish black metal band who are out to bring negativity to the world. One read of the band's Myspace bio and you'll understand exactly what sort of feeling you are going to get from listening to this album. Likdagg is the band's second album. This Swedish quartet is one of a number of bands combining black metal with industrial metal. In Horde Of Hel's case this has led them to sounding much like a black metal version of Ministry. Likdagg contains twelve songs that all have a very evil, sinister feel to them. They range from all out blasting attacks to more ponderous, bludgeoning doom-laden songs. The whole album lasts just under an hour but feels a lot longer no doubt due to the repetitive riffing and oppressive atmosphere. Easy listening this is not. That this album is powerful is beyond question. The songs all have an underlying mesmerizing quality that will keep you interested long after your brain has melted and you've turned into a mewling, slack-jawed idiot due to the crushing sonic force assailing your ears. However, there is a lot of stuff on this album that I just don't understand. One of these is the five minute finale Hären. This song is, well, actually, I have no idea what it is. Noise perhaps? Whatever it is, its not enjoyable. Too much feedback and random wailing! These moments rear their heads at random intervals during the album and in my opinion ruin it somewhat. Overall, this is a good attempt at industrial black metal that, on the whole, works well. If you're a fan of incredibly oppressive albums that you really have to put effort into to listen to then you could do a lot worse than Likdagg.